The estate seems to have been bought by the Gordon family – apparently of Gordon’s Gin fame – and was lived in by them until the start of the Second World War when the house was requisitioned for Allied troops. The Gordons sold it after the war to a Mrs McRae who attempted unsuccessfully to convert the house into flats. In 1948 she sold the estate to Mr F A Wagstaff, the grandfather of Mrs Janet Phillips who now lives with her family in the large stables. The main house itself was in a bad state of repair and impractical for post-war England and Mr Wagstaff demolished it in the 1950s – there were no planning permissions in those days. Alexander Gordon was apprenticed to a Mr Rattray in Dundee where another of his mother’s brothers, George Gauld, was ‘Rector of the Academy and Preacher of the Gospel’. The teaching at school and under Mr Rattray must have been sound for Alexander is subsequently recorded as having ‘charge of Brewery, Aberdeen and then of Gilcomston Brewery’ – aged only 18! In 1838 he came to Farquharson’s Lochnagar Distillery for several months before leaving for London. His brother John trained as an engineer in Aboyne and Aberdeen and then spent seven years in Ceylon with his three youngest brothers. (The eldest brother also went to Ceylon!) He returned to London in 1850 to establish his own firm, John Gordon and Co., Colonial Engineers. Alexander spent his first year in London working for Truman Hanbury and Burton’s Brewery. Thereafter he too became involved with engineering, spending the next 13 years (1839-52) first at Deptford Iron Works and then Tindall’s Millwall Wharf. During that time – in October 1844 – he married Miss Elizabeth Mickle in London. In his last year at Millwall he started building his own Caledonian Road Brewery. This opened in 1852, followed in 1876 by his Peckham Brewery. The success of these ventures left Alexander a wealthy man. Perhaps while working at Lochnagar, or earlier, Alexander is said to have witnessed a tragedy. With other guests he had escorted two young friends, whose marriage had just been celebrated at Glenmuick, to a river crossing. It was a wild day, the Dee in spate. Part way across an accident occurred and the young couple were drowned. Alexander vowed that if ever he had sufficient funds he would replace Polhollick ferry with a bridge. This he did in 1892 and the bridge bears a plaque honouring Alexander Gordon of Southwood, Hildenborough, Kent.. But the bridge was not his only gift. To show his love for Deeside he presented buildings for public recreation, entertainment and education to Ballater. The Albert Hall opened in 1874; the Victoria Hall and Gordon Institute followed in 1895. It is believed that he also contributed to the building of Glenmuick Church. Alexander and Elizabeth celebrated their golden wedding in 1894 but there were no children. In 1895 Alexander died to be followed in less than six months by Elizabeth. 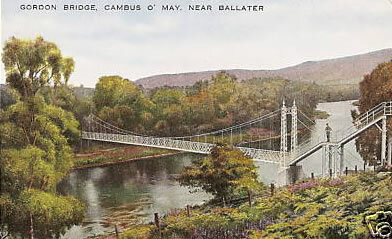 However, this was not the end of his generosity for 10 years later the lovely bridge at Cambus O’ May was built. It is interesting to speculate how much of the engineering skills of Alexander and his brother John went into the design of the halls and the bridges.